This week brought us our first look at Mysterio in the upcoming Spider-Man: Far From Home, as Jake Gyllenhaal (or possibly his stunt double) was snapped on the set of the sequel in costume as Quentin Beck, the master illusionist known as one of Spidey’s most persistent foes in the comics. From what we could tell, the costume he was wearing looked surprisingly faithful to the villain’s usual look, except for one thing. His iconic fishbowl helmet was missing. Fans would be crushed if the admittedly silly-looking helmet didn’t appear in the movie, so the costume designers must have surely found a way for it to work in the more grounded world of the MCU. 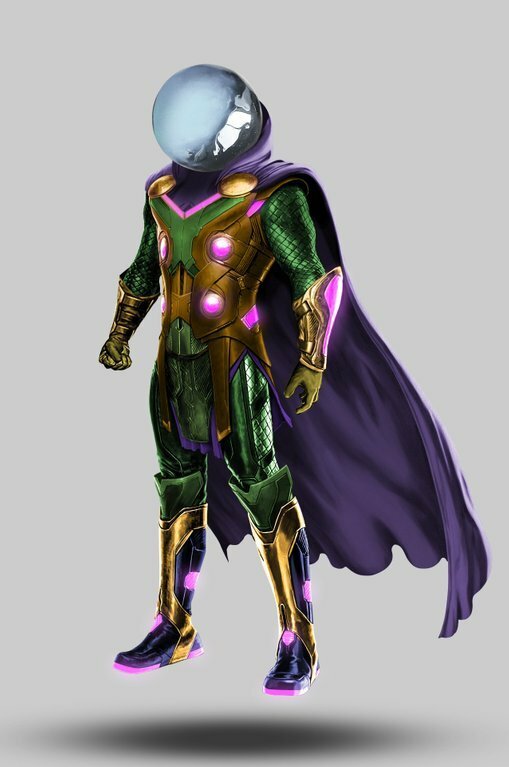 Could the full look for Mysterio, for instance, appear something like what we have below? Digital artist Boss Logic has devised a piece of impressive fan art that we have to say would be pretty awesome if realized on screen. There’s no telling if the filmmakers will end up going for this particular look, but check it out for yourself down below and see what you think. Could Mysterio Look Something Like This In Spider-Man: Far From Home? As you can probably tell, Boss Logic has clearly painted his Mysterio costume over some Thor concept art. However, this isn’t just a time-saving practice but a nod to how much the costume seen in those Far From Home set pics looks like the God of Thunder’s. The artist even theorized that Marvel could have based the look off some Thor designs themselves. While fans would love to see the fishbowl make it into the movie, there really is no way of telling what the studio will do with the character at this point. Spider-Man: Homecoming previously played fast and loose with the version of the Vulture from the page and ended up creating one of the most memorable MCU baddies to date, as brilliantly played by Michael Keaton. If they can repeat the trick this time around, we can probably give them a pass for not including the helmet. Either way, we should find out what they have planned for us soon enough, as Spider-Man: Far From Home is set to swing into theaters on July 5th, 2019.